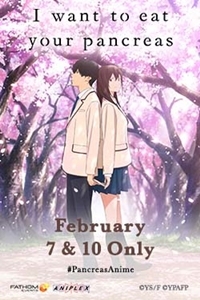 Fathom Events and Aniplex bring "I want to eat your pancreas", an uplifting, coming-of-age tale that has captivated the hearts of millions, to movie theatres this winter for an exclusive two-day event featuring both subbed and dubbed versions. Produced by Studio VOLN (Ushio & Tora) with Shinichiro Ushijima (One Punch Man, All Out!! ), film captures an emotional journey between polar opposites who discover the true meaning of compassion while trying to find happiness.